I know this is becoming routine to apologize about not posting enough, but I’m still feeling really guilty. There’s been a lot of things going on in my personal life. I suppose I have been feeling a bit depressed and among that, I’m getting a scary health procedure done soon. And things have been changing at work – new management, presentations (which I am so lame at because of my lack of confidence), increased work load, etc! Anyways, really sorry about this boring real life stuff. I’m typically not the type to spill this information on the internet. Hopefully things will pick up again soon. I’m planning my own kind of fashion related changes so I will be blogging about it! So I’ll show you how I do my every day hair do! It’s very simple, but simple is best, I suppose? I just hope I’m not being too patronizing in the simplicity of it.. 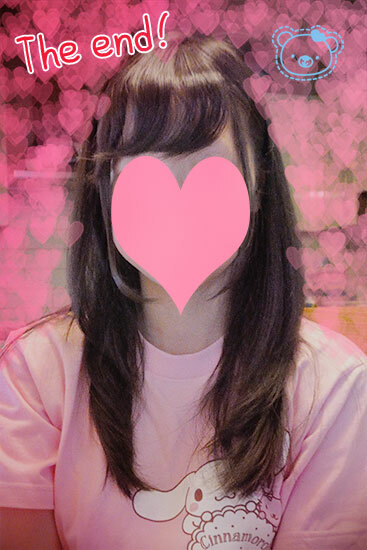 However, it is a popular look at a lot of Japanese girls do though as it helps frame your face very well. I especially like it as my face shape is a bit square-ish. A lot of these aren’t necessary, however! Step 1) It begins with your routine of washing your hair. I typically wash everyday, but if you don’t – that’s OK. Styling your hair works even better if you don’t wash every day. Obviously, focus on washing the roots of your hair. I don’t actually apply any shampoo anywhere else, ie. the tips of my hair. Step 2) Condition the ends of your hair. This will prevent the ends from looking dry. Step 3) You’re done with your shower and now it’s time to blow dry. I typically blow dry my hair every time after washing. The reason why is my hair can get all funny shaped even if I sleep with it dry. Blow drying it helps me to keep it straight. 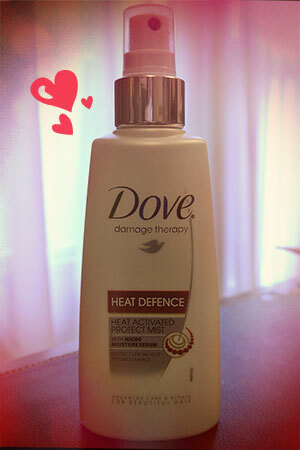 Tip #1 – Because I need to put my hair through heat everyday, I use this heat protector to protect my hair from all the heat damage. I haven’t really noticed much between different brands I used.. I just buy the most inexpensive one. Tip #2 – I have bangs. And I want them to go in one direction, not part in the middle. It’s really embarrassing when that happens! What do I do to prevent that from happening? I use hair velcro. What is hair velcro? 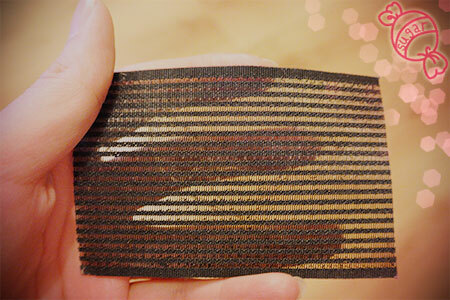 It’s not your typical velcro used in clothes. It’s much more gentle and can be used to hold hair in place without leaving marks on your hair – something like bobby pins might do. You can find them very cheap on eBay, but obviously you don’t need it to achieve this. If you want your bangs to rest on the LEFT side of your face, use the hair velcro to put them on the RIGHT side of your face. For whatever reason, it needs to be opposite to give it a nice kind of curl! Tip #3 – Brush your hair as blow dry to keep your hair straight. 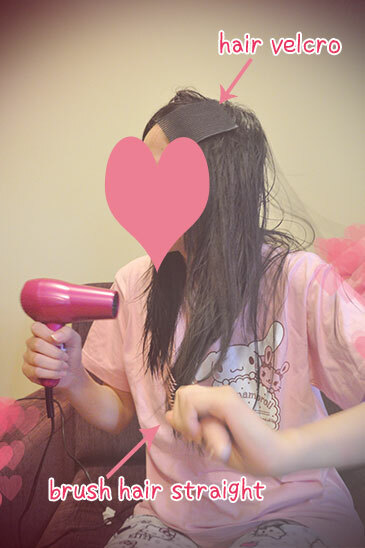 You can also dry your hair with the hair velcro in place. After your hair is almost dry, you can remove the hair velcro. 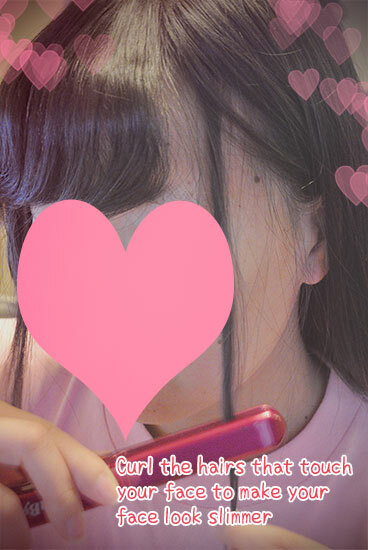 Your bangs should now be parting correctly. And now you can also dry the rest of your bangs! And after I’m done with hair drying – it looks like this! My bangs AREN’T parting in the middle but on the side. If you don’t want any curls in your bangs, you can stop here. But I usually don’t because I feel my hair looks so flat and boring! 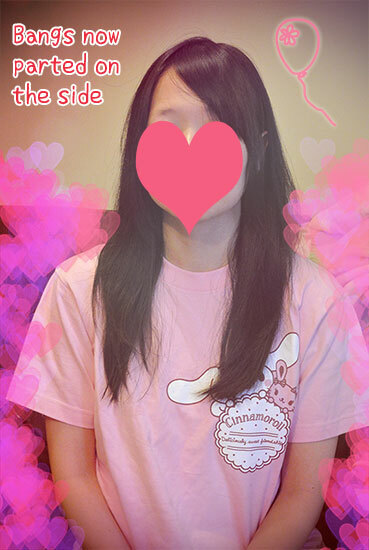 Tip #4 – If you don’t care about how your bangs part, you can blow dry your upside down. This will increase the volume of your hair. Step 4) Prepare bangs for curling. 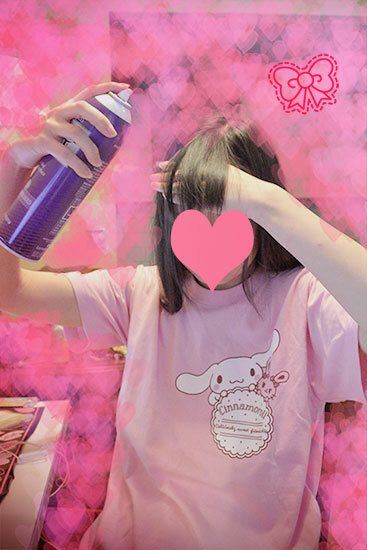 Spray your bangs with hair spray. Let it dry a bit before applying heat or you’ll get a “sizzle.” It’s important to do this to give your bangs the hold to last the whole day. This really works for me in even dampy, windy Ireland. 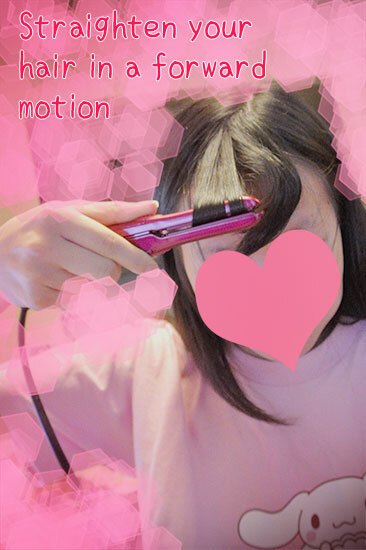 Step 5) Curl your bangs! Do it in a forward motion. I prefer to use a straightener to curl my bangs. You won’t get such a dramatic curl which you don’t really need for your bangs. I even tend to do this the night before going out as opposed to the morning to lessen the drama. 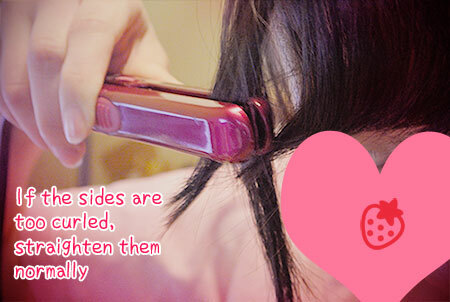 To curl your hair with a straightener, put your bangs within the clasp and pull it out in a forward motion. 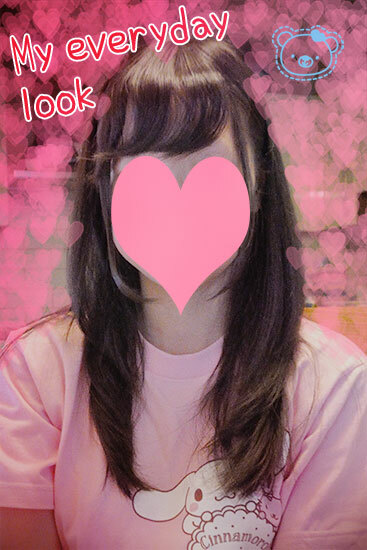 You basically want to straighten your bangs in the shape of a curl. You can see what I mean from below. After that your hair will naturally curl to the side – maybe even too much! If that happens, then just straighten it up a bit. 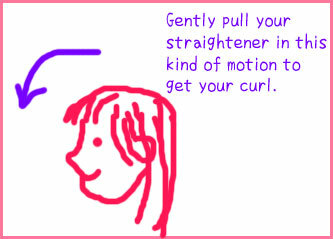 Also, brush out your curls. Step 6) Curl the hairs that touch the side of your face. This helps my face looks slimmer and every girl wants a tiny slim face, right? Yes.. it’s very simple. But it’s a good every day look that’s still very girly and easy to do!